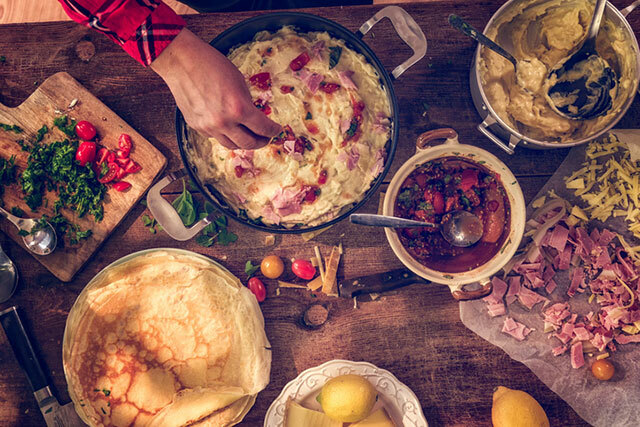 French food and French cooking took hundreds of years to develop, and like food everywhere it reflects the history of the country in which it developed. By the 17th century the French class system had created great inequality, and this meant rich, upper-class people could employ chefs and eat expensive delicacies and fancy dishes, while poor lower-class people had to eat very cheap, low-quality food. By the 19th century the high-quality food of the rich was called haute cuisine or "high cooking", and the low-quality food of the poor was called peasant food. But a lot of these peasant dishes, including hundreds of soups and stews, had gradually become part of haute cuisine after chefs began making them with better ingredients and cooking techniques, and these dishes are still an important part of haute cuisine today. In the 1960s, a new cooking style called nouvelle cuisine or "new cooking" developed. It modernized French cooking by using fewer of haute cuisine's basic stocks and sauces like the rich and creamy Hollandaise sauce. It also introduced regional cooking styles with more natural flavours and healthier ingredients. As a result, French restaurants now serve a greater range of cooking styles than ever before. 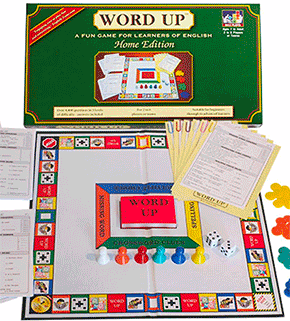 Some serve traditional haute cuisine, others serve nouvelle cuisine, and some focus on regional or home-style cooking. You can also find many French restaurants and bistros that offer a mix of these styles. 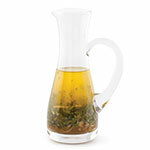 Most French people eat a light breakfast of French bread or croissants with honey or jam, and tea or coffee. For a bigger breakfast, they might have bread with ham and cheese or a savoury paste called pâté, or a grilled ham and cheese sandwich called croque monsieur. Breakfast is often a small meal, but lunch and dinner are much bigger meals that can last for two hours or more. Both are usually three-course meals taken with wine and cheese plus tea or coffee. The three courses are an entrée consisting of soup or savoury foods, a main course including meat and vegetable dishes, and a dessert or pastries. Entrée choices can include clear soups like French onion soup, thick soups like lobster bisque, and small savoury dishes known as hors d'oeuvre. Popular hors d'oeuvre include meat, fish or vegetable-filled vol-au-vents and a dish called crudités in which raw vegetables like carrot, cucumber and celery sticks are dipped in a vinaigrette sauce. Some hors d'oeuvre are made with expensive delicacies such as caviar, truffle, or a kind of oversized liver made by force-feeding ducks or geese called foie gras. 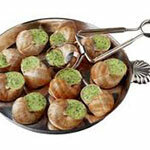 Another dish often served as an entrée is escargot, or cooked snails. Even though snails were peasant food at first, they became a delicacy when haute cuisine chefs began removing the flesh and flavouring it before returning it to the shells. The second course is usually the main course in which a meat, fish or poultry dish is served with side dishes of vegetables. 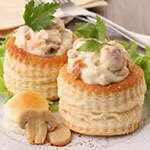 Like escargot, many haute cuisine and nouvelle cuisine main course dishes originated from lower-class dishes. For example, a spicy fish and vegetable stew called bouillabaisse was first invented by poor fishermen in Provence as a way of using bony fish they couldn't sell in the market. 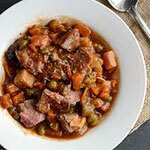 A peasant dish that's also from Provence is a beef or lamb stew cooked in wine called daube. 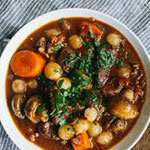 Beef bourguignon from the eastern region of Burgundy is another famous stew. It's made by slowly cooking pieces of beef in red wine before adding garlic, onions and mushrooms. 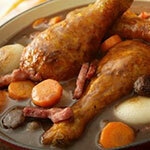 Burgundy is also where the famous chicken dish coq au vin is from. 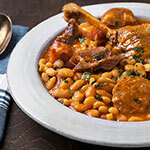 Another peasant dish that later became a haute cuisine favourite is cassoulet, a casserole of pork sausages and pork skin, duck or goose meat and haricot beans. As well as meat dishes, main course options can include vegetarian dishes like ratatouille, a popular vegetable stew. Vegetables are also prepared in various ways as side dishes. 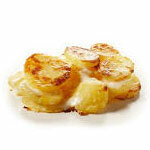 They can be fried, as in French fries, or sliced and baked in milk as in dauphinois dishes like gratin dauphinois. Many other vegetables like eggplant, carrot, zucchini, leek and mushrooms are also important in French cooking. The third course in a French lunch or dinner is usually dessert, and some of the most popular of all French foods are desserts and pastries. They're made by a special chef called a pâtissier and sold in bakeries called pâtisseries. The most well-known French desserts include the custard-like crême brûlée and the light and creamy mousse. 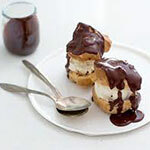 Favourite pastries include the éclair, a long, cream-filled pastry, and the profiterole, a small ball-shaped pastry sometimes called a cream puff. There are many other delicious French desserts, all worth trying if you have the chance. One of the most versatile of French dishes is the quiche, a savoury flan with a filling made of eggs and cream plus other ingredients like cheese, spinach, mushrooms, ham or bacon. 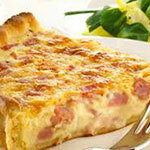 Quiches can be served hot or cold as entrées or as main course dishes. Another versatile French dish is the crêpe, a thin pancake that can be served with savoury fillings as an entrée or as a dessert in dishes like crêpes Suzette. 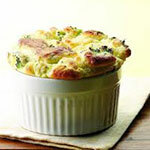 The soufflé is another versatile food that can be both savoury as in a cheese soufflé, or a sweet dessert like chocolate soufflé served with cream or ice-cream. beef bourguignon (also "beef Burgundy") (noun): beef braised or stewed in red wine sauce - I'm trying this new recipe for beef bourguignon. 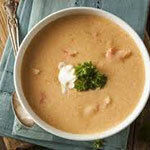 bisque (noun): a thick soup made from shellfish - May I recommend this evening's lobster bisque? bistro (noun): a small French restaurant serving affordable home-style food and drinks - There are thousands of little bistros in Paris. 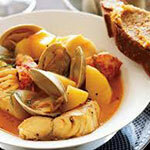 bouillabaisse (noun): a spicy stew of fish and vegetables - Did you know that fishermen in Provence invented bouillabaisse? cassoulet (noun): a southern French casserole made of various meats and haricot beans - Is there anywhere around here that serves cassoulet? coq au vin (noun): chicken cooked in red wine sauce - Our mum makes the best coq au vin in the world! 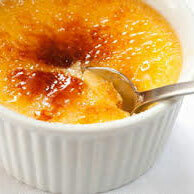 crême brûlée (noun): custard with a burnt caramel top - I'll have the crême brûlée for dessert, please. 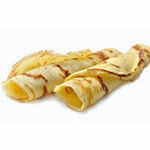 crêpe (noun): a very thin pancake - They serve crêpes with savoury as well as sweet fillings. 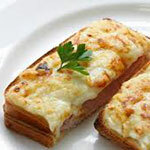 croque monsieur (noun): a ham and cheese sandwich that's toasted or grilled - I could eat half a croque monsieur if you want to share one. 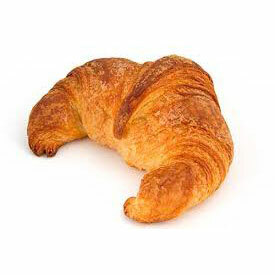 croissant (noun): a light, flaky crescent-shaped roll eaten for breakfast in France - Let's get some croissants and jam and lots of coffee. dauphinois (adjective): sliced and cooked in milk, usually with a cheese topping - How many potatoes do you slice up to make gratin dauphinois? daube (noun): a beef or lamb stew cooked slowly in wine - The poor ate cheap dishes like daube, while the rich ate haute cuisine. delicacy (noun): a rare and expensive food seen as a symbol of wealth - Why are foods like truffles and shark fins called delicacies? 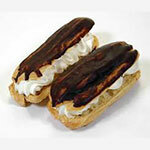 éclair (noun): a tube-shaped pastry with cream inside and chocolate on top - The éclairs in that pâtisserie are amazing. entrée (also UK "starter" and US "appetizer") (noun): the first course of a meal - In France entrée means "starter" but in North America it means the main course. escargot (noun): cooked snails eaten as a delicacy in France and Catalonia - Did you know you'd get snails when you ordered escargot? foie gras (noun): a delicacy made from the fatty livers of force-fed ducks and geese - Foie gras livers are up to ten times bigger than normal ones, you know. 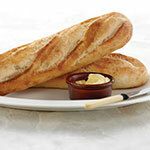 French bread (also "baguette" or "French stick" or "French loaf") (noun): a long, thin loaf of soft white bread with a crunchy crust - Let's get some French bread. 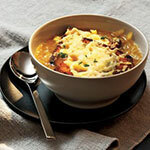 French onion soup (noun): a soup made from onions and meat stock - Do you like grated cheese in your French onion soup? haute cuisine (French for "high cooking") (noun): high-class French cooking served in expensive restaurants and luxury hotels - Poor people lived their whole lives without ever eating haute cuisine. hollandaise sauce (noun): a creamy sauce made with butter, egg yolks and vinegar - Hollandaise sauce is one of the five basic sauces haute cuisine is based on. hors d'oeuvre (noun): a small savoury dish served as entrée (or starter or appetizer) before the main course - How many kinds of hors d'oeuvre can you make? 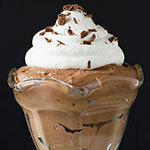 mousse (noun): a smooth, light-textured dessert made with cream and eggs - I'll have the chocolate mousse, please. nouvelle cuisine (French for "new cooking") (noun): new style of French cooking with simpler techniques and fresher ingredients than haute cuisine - French chefs started creating nouvelle cuisine dishes in the early 60s. 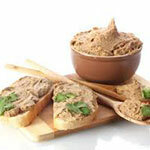 pâté (noun): a smooth savoury paste made from finely-minced meat or fish - Could you pass the duck liver pâté, please? pâtisserie (noun): a shop that sells French pastries, desserts and breads - I got some éclairs from the pâtisserie. profiterole (noun): a small ball-shaped pastry with cream inside and chocolate on top - I love profiteroles, but I'll get fat if I eat too many. peasant (noun): a poor farmer forced to work for wealthy aristocrats - Most of the food peasants grew was taken off them and sold. quiche (noun): a dish in which a mixture of eggs, cheese and other ingredients is baked in a round flan base - Isn't the quiche with bacon in it called quiche Lorraine? ratatouille (noun): stewed vegetables, incl. 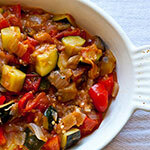 tomato, garlic, onions, zucchini, eggplant and various herbs - There's no meat in ratatouille, is there? soufflé (noun): a dish made with eggs that rises into a high, round shape when baked - My soufflé collapsed when I took it out of the oven. stock (noun): a liquid used to make soups, stews, sauces, etc. that's made by boiling bones, meat or vegetables - Did you make the beef stock yourself? vinaigrette (noun): a mixture of oil, vinegar, herbs and spices used as a salad dressing or a marinade - Which herbs did you put in the vinaigrette? vol-au-vent (noun): a small round pastry case filled with a mixture of meat, fish or vegetables - Let's fill the vol-au-vents with salmon mornay.